Inspired by the entertaining sights and unique, carefree spirit of Venice, California, Fender set out to create a soprano ukulele that captures it's vibe: the Venice Ukulele. Thanks to it's compact, comfortable body size, the Venice travels easily from the beach to the studio or jam session, offering the classic, light sound that uke players love. 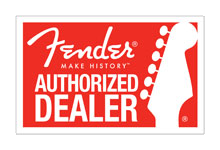 Elderly Instruments is an authorized Fender® dealer.